Using hashtags on Twitter is a great way to join an existing conversation and make your tweets more discoverable. A hashtag is a word or phrase (no spaces) that starts with #. When you click on a hashtag in Twitter, it reveals all the tweets marked with that hashtag. Here are some of the most useful ones for authors. #amwriting and #amediting—Highly used and shared, these hashtags are a must when you are in the writing or editing stage of creating a work. Use them to tell people what you are working on and to connect with other writers. They have even spawned a web community at www.amwriting.org. #writetip and #writingtip—These resourceful hashtags offer tips and tricks for writers. #writingprompt—This tag offers prompts to help break writer’s block. #bookgiveaway—If you choose to run a book giveaway, this hashtag is a great way to let people know about it. #teasertuesday—Use this to highlight a favorite line or paragraph (or a link to a blog post containing them) from your book or current manuscript. Most often used, logically, on Tuesdays. #indiethursday—Book lovers tweet about what books they bought at independent booksellers that week. #fridayreads—This hashtag lets people know what book you are currently reading. It provides a great opportunity to support your fellow authors on Twitter by recommending books on Fridays. #ff—The original day of the week hashtag (which stands for “Friday follow”) is a way to call out other Twitter accounts worth following. Recommendations don’t have to be book-related, and can often lead to a Twitter conversation with the person you recommend. #samplesunday—A chance for writers to link to an excerpt from their book or work in progress. #poetrymonth—This is the hashtag for National Poetry Month, which takes place in April. #shortreads—This hashtag generally relates to short stories and gets used most intensively in National Short Story Month, in May. #nanowrimo—This is the hashtag for National Novel Writing Month, which takes place every November. Don’t use more than three hashtags in a single tweet. 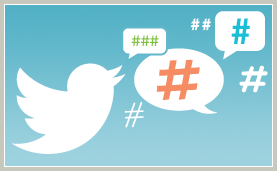 Hashtags can appear anywhere in a tweet, but they are most frequently used at the end. Publishing Talk gives some good examples of tweets containing some of the hashtags we’ve highlighted. This article by author Orna Ross contains additional useful hashtags. Problems with hashtags? Look here for common issues and solutions.